Sticky notes are one of a handful of tried and true productivity tools that have successfully made the transition from the "real world" onto our computer monitors. But they must be used in moderation: Having too many little notes plastered all over your desktop can make it difficult to focus. But what if each note had a sense of context? What if your sticky notes came and went intelligently, were right there when you needed them, and gone once you've switched to a different task? That's the value proposition behind [You must be registered and logged in to see this link.] (free for personal use; a shareware version is available for commercial use). GumNotes overview window, with a single sticky note showing. 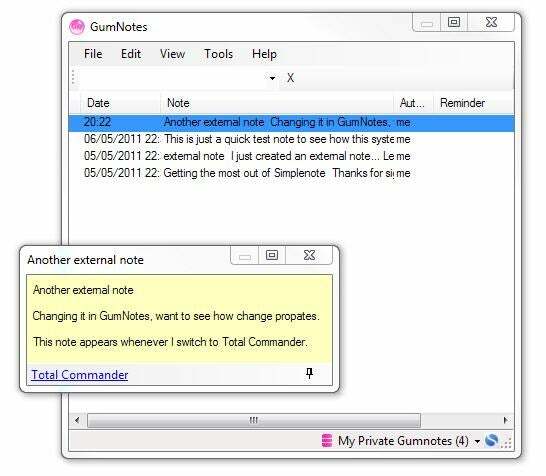 At its core, GumNotes is a sticky notes application like many others. But it prides itself on two distinct features: It can attach sticky notes to specific windows (similar to what Stickies can do), and it can synchronize with the online cross-device note service Simplenote. If you enable Simplenote synchronization, any notes you make using GumNotes will be available on any other devices you connect to Simplenote, such as another computer, an iPhone or iPad, or (with a third-party app) an Android smartphone. A notes application should be instantly available when you need it. GumNotes takes this into account, and provides three system-wide hotkeys. By default, pressing Ctrl+Q in any application would bring up the GumNotes overview window; Ctrl+R creates a "related note" linked to the current window, while Ctrl+L creates a blank new note. If those shortcut keys seem familiar, that's because they're used by many applications across a typical Windows system. Ctrl+Q is often used for quitting applications, while Ctrl+R is used for refreshing the current page in Firefox, Chrome and other Web browsers. Ctrl+L is used by Microsoft Word and other word processors for left-aligning text. Unfortunately, GumNotes effectively hijacks these shortcut keys: GumNotes' own shortcut keys are enabled by default, and many users might be surprised to discover Ctrl+Q no longer does what they expected it to do. The developer, Axonic, tells PCWorld they're aware of this issue, and this will be fixed in future versions. Those users savvy enough to access GumNotes' options dialog and modify the shortcut keys would be disappointed to discover that they can only set single-modifier hotkeys, i.e, Ctrl+letter, Alt+letter or Shift+letter. That's right: You can set a capital letter (say, A, produced by a Shift+A keystroke) to activate GumNotes across your entire system. That may be an amusing prank for some, but is certainly not a useful feature. On a happier note, GumNotes' Simplenote synchronization seems to work quite well. It's rudimentary: You cannot set tags for your notes as you create them, but it does upload your notes to the cloud. If you're after a dedicated Simplenote client, you would be much better off with ResophNotes, which is an impressive free client. The context-sensitive notes feature also works. I tested it by setting a note to appear whenever I activate [You must be registered and logged in to see this link. ], and appear it did. I would then close it, and it would re-appear the next time I switched to Total Commander. To make it go away for good, I had to right-click it and select Delete from the context menu. GumNotes also offers a Pro version which supports several note databases and allows professional and commercial use. The free version is not for commercial use. When it comes down to it, there are both better sticky-note applications around (such as the free [You must be registered and logged in to see this link. ]), and better Simplenote clients ([You must be registered and logged in to see this link. ], also free). But if you're looking for an application that combines both and don't mind the quirks, go ahead and give GumNotes a spin.